These words by English poet William Blake remind us that minute, apparently inconsequential events in a life can represent universal truths. Ulas Samchuk’s character Maria is such a grain of sand––or in the context of the novel, such a kernel of grain. The life of this uneducated woman spans upheavals in Ukrainian history from approximately the 1861 emancipation of serfs in the Russian Empire under the Tsars, to the nearly unimaginable horror of the communist-induced mass starvation in Soviet Ukraine in the early 1930s that killed millions, and is internationally recognized as an act of genocide. Samchuk dedicates his novel “to the mothers who died of hunger in Ukraine in 1932-33,” yet the story is much more than that, taking the reader through three stages: A Book about the Birth of Maria, A Book of Maria’s Days, and A Book about Bread. 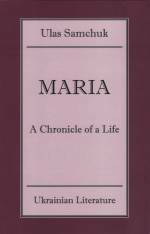 Each is important in its own way, as Maria grows, matures, and reacts to the changes going on around her. She may be just a bit of flotsam carried by a tsunami of social and political change, but her loves, trials and toil through three score and ten (the author tells us that she lived for 26,258 days, or nearly 72 years) enable us to picture a harsh existence that prompted hundreds of thousands of Ukrainian peasants to abandon their beloved villages and emigrate in search of land, freedom, education, and opportunity. There is obvious symbolism in how Samchuk names his lead female character: Maria is a reflection of Mother Mary, and Maria’s daughter is named Nadiya, or “hope.” Yet Maria is no Virgin Mary and Samchuk honours his character by portraying her as a real woman, with the flaws that all humans have. Land is a theme that runs throughout the novel, as is the grain, or bread, that it produces. Land literally was life for small-scale farmers. Life revolved around, and depended on, the cycle of planting and harvesting grain, vegetables and fruit. An ethos of hard work, of providing for one’s family, grew from this bond to the land. Without hard work, without sweat, a family would not eat. And with backbreaking labour came the satisfaction and joy of putting food on the table, of perhaps getting ahead a bit by growing enough so that a small surplus could be sold to buy a cow, or a pig. The 1861 emancipation in the part of Ukraine controlled by the Russian Empire was viewed by the peasantry as a chance to finally be rid of forced labour, to expend all one’s efforts on farming one’s own plot of land. While it soon became evident that the “reforms” still heavily favoured the landed aristocracy, there was more opportunity for diligent former serfs to rise out of poverty, and even prosper. He is discovering an ever greater delight and joy in work. His vagabond-proletarian habits are fading into the past and being forgotten. The earth is drawing him into itself and filling his veins, his mind, and his entire being with solid habits. Korniy is now aware of this. His days as a freewheeling sailor are being forgotten and he is becoming a true human being. He slowly shakes off his vile cursing, begins using his native language, and this change restores him to the bosom of his family. Samchuk’s characters are not simply one-dimensional “peasants.” They are human beings who labour and love, suffer and grow, celebrate small victories, and mourn terrible losses. The author shows us how similar experiences can have dramatically different effects on people––some lift themselves from their wanton ways and find reward in work, community, and their church, while others take advantage of turmoil to further themselves at the expense of others. For those who worked hard, there were rewards, simple as they may have been. Korniy, Maria and the elderly mother sit down at the table set with various dishes. There is everything here. Take whatever you want, whatever you feel like eating. Everything is good, everything is homemade, earned through the toil of their own hands and their patient endurance… Break off a piece of bread and eat it. Eat the bread, the cabbage, the varenyky. Eat the cabbage rolls and the fried fish. Eat the granular kutya and drink with it fruit juices from your own orchard. Wash it all down with honey gathered from the flowers of your native land. But in the end, there was never enough land, and consequently Ukrainians began emigrating in significant numbers in the late 19th century to places like Canada, the United States, Australia and South America. That flow continued in spurts through the early 20th century, whenever the opportunity arose between wars, revolutions, and totalitarian regimes, with one final exodus following World War II, before the Iron Curtain fell, cutting off contact between the USSR and the rest of the world. Maria gives the modern reader a sense of how that love of land, combined with a lack of it, led to the conditions in which hundreds of thousands of Ukrainians left their native villages. Initial reaction to the February and October Revolutions of 1917 that swept away the Tsar was often positive among the peasantry, with promises of more land, more freedom, more education… But with the new regime came the idea of creating a new Soviet man, and that meant destroying religion and age-old traditions, and replacing them with socialist slogans and “five-year plans” in which the central government imposed agricultural and industrial production quotas that had to be filled no matter what the reality of local conditions was. When such quotas could not be filled, the next “solution” was collectivization, or the forced amalgamation of peasants’ farms. Farmers no longer worked for themselves, they worked for the collective. Farmers no longer made decisions on what to sow, and when to sow it. All such decisions came from above, often with disastrous results as inexperienced administrators parroted demands from the central authorities. There was no choice in collectivization. There was no opt in, or opt out. If a farmer resisted, land, seed, tools, equipment, and animals were all expropriated, and any further stubbornness was met with incarceration in a prison camp, exile to Siberia, or simply a firing squad. And the bolt-hole of emigration was sealed, not to open again until the 1990s, when Ukraine gained its independence. While there were similarities in the governance of the Tsars and the Bolsheviks, for example both attempted to assimilate cultures and languages through Russification, in the end it was the Soviet regime that perpetrated almost unimaginable mass terror on Ukraine. Under Soviet rule, Ukraine, the “breadbasket of Europe,” became a basket case. And when farmers en masse refused to join the shoddily run collectives, Stalin and his henchmen felt no compunction in sealing the borders of Ukraine, expropriating all of its grain, vegetables, fruit and livestock, and letting entire regions starve to death. As Ukrainians died by the hundreds of thousands, and eventually millions, grain was being exported from Ukrainian ports under communist Red Army guard. Where were human hearts? Where was conscience? They take good care of an animal, they care for a plant, they care for an insect, they even take care of the lowliest worm, but they don’t take care of a human mother. The contrasts that Samchuk portrays through this chronicle of Maria’s life through her family and her village are stark, but real. Readers feel the grit, the sorrows, the happiness, the disillusionment in the government, and the utter helplessness in the face of totalitarianism. In a sense the novel is a history lesson, but it is written so compellingly that readers are pulled along by the thread of Maria’s story. It truly is the life of a simple woman who lived through one of the most tragic periods in human history. It should be noted that this translation is based on the 1952 edition in which in the preface it is stated that the author made substantial changes to the third section.